Police at the Belfast Road school. Police in Carrickfergus are reminding drivers of their responsibilities in the vicinity of schools. It follows a number of reported issues in the town. PSNI officers were present at drop-off time on Thursday at Model Primary School on the busy Belfast Road. 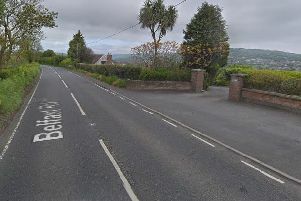 Carrickfergus PSNI stated: “A number of motorists were spoken to about parking on footpaths and the nearby bus stop. “This is all in aid of making everyone’s morning easier and keeping the ‘little ones’ safe.